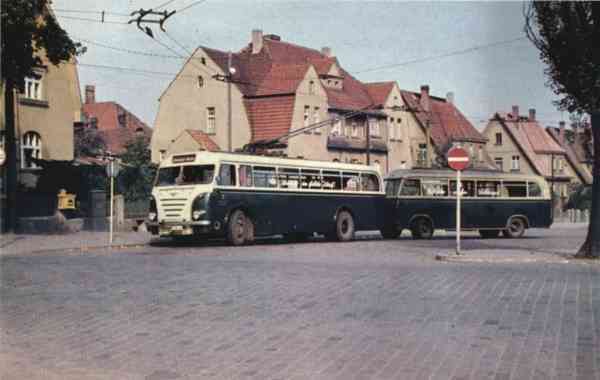 The rolling stock becomes in October 1953 about a trolleybus of the GDR type LOWA W 602a no. 9II with trailer of the GDR type LOWA W 700 of the company VEB Lokomotiv-und Waggonbau (LOWA) Werdau//GDR expanded. Another trolleybus of the GDR type LOWA W 602a no. 4III of the company VEB Lokomotiv-und Waggonbau (LOWA) Werdau//GDR was putting into service in 1956. This trolleybus attracted attention through a special lacquering (partially ivory-colored front section) and through its very comfortable, red imitation leather benches in the passenger compartment. 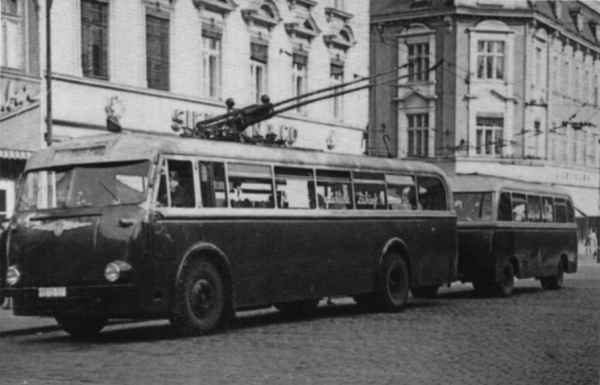 Both trolleybus-trailer combinations were delivered in January 1959 to Berlin. They were there with the car numbers 1547 and 1548 in the use. The trolleybus no. 1547 (former no. 4III) was until 1971 and the trolleybus no. 1548 (former no. 9II) up to the closure of the Berlin trolleybus traffic in the year 1973 in the use. The photo shows the trolleybus no. 9II (year of construction 1953) with trailer of the GDR type LOWA W 700 at the bus stop Karl-Marx-Platz in direction to Hauptbahnhof (main station). The photo shows the trolleybus no. 04III (year of construction 1956) with trailer no. IX (type LOWA W 700, year of construction 1953) on the line Westend-Nordend at the final stop Westend/Boldtstraße in September 1957.